As part of the business planning process, the Executive Board has determined the principal group risks based in part on the risks that have been identified within the business units. The board has looked at how these risks affect the achievement of the strategic objectives and the materially relevant themes. The group risks are listed in the risk matrix and will be discussed in detail below, as will changes in the risk profile with respect to 2015. For the financial risks, please refer to the ‘Financial risk management’ chapter in the financial statements. Market regulation, Brexit and ScotRail have been added. The market regulation risk has increased because of the market regulation study that was requested during the parliamentary inquiry into Fyra. The ScotRail risk has arisen due to unrest in Scotland (strikes, operational result and negative press coverage, economic developments and transformation of the infrastructure). In the past year, an intensive process has been followed to reduce the risk of us failing to comply as a company with the Railways Act and the Competitive Trading Act. We have also reduced the risk of us not applying a level playing field by implementing various measures to such an extent that this is no longer a top-priority risk. We do still pay continuous attention to the need to act with integrity, for instance by including this in the corporate culture programme that is being rolled out. The risk of the arm's-length management of Abellio is no longer a top-priority risk. Agreements have been made with the Ministry of Finance on the parameters within which Abellio can do business. The governance structure has also been modified to ensure the right balance between management at a distance and control of the risks. In the table below, we have categorised the group risks into the COSO risk areas used by NS. 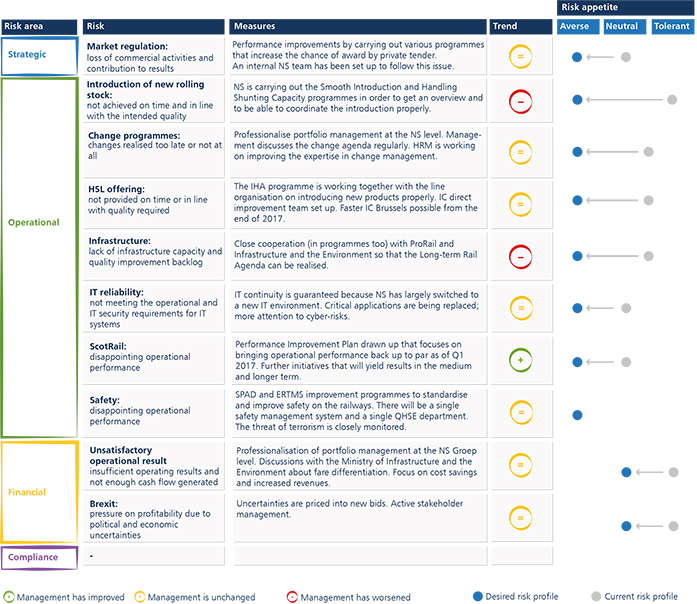 The table gives the most important measures for each risk, shows the trend in how it is being controlled and compares the desired risk profile (blue dot) against the current risk profile (grey dot). The current performance is used to make an estimate of the current risk profile. Based on the above overview, NS is prioritising the following risks: the introduction of new rolling stock, change programmes, the HSL service and the infrastructure.